Hippy forced to pose by the results board after riding a sub-hour 25. 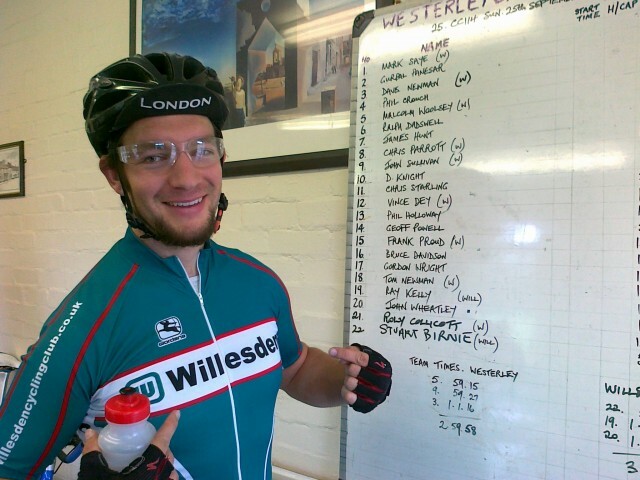 Stuart Birnie rode under the hour for the first time in a 25 mile time trial this morning on the CC114 Great Missenden Amersham Road course, with a superb time of 59.44. 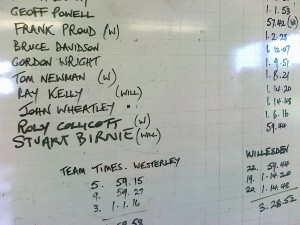 The event, promoted by the Westerley, saw entries from a range of clubs, and was won by Geoff Powell with a 57:42. This entry was posted in Events, Time trials. Bookmark the permalink. Chapeau Stuart. Hill Climb next? Great reading on Hippy’s own blog. All you non-starters might learn a bit about time trialling.